Sierra Burgess Is a Loser is an American teen comedy-drama film directed by Ian Samuels from a screenplay by Lindsey Beer featuring music by Sabrina Carpenter. The film is a modern retelling of the Cyrano de Bergerac story, and stars Shannon Purser, Kristine Froseth, RJ Cyler, and Noah Centineo. The film was released on September 7, 2018, by Netflix. Sierra (Shannon Purser) is a smart but unpopular girl who aspires to get into Stanford University. She does not fit the traditional standard of physical beauty, but she has a personality full of wit and charm. Popular mean girl Veronica (Kristine Froseth) frequently attempts to make Sierra's life miserable, showering her with cruel taunts and comments, especially regarding her appearance, which she often effortlessly and wittily sidesteps. When Jamey (Noah Centineo), a handsome football player from another school, asks Veronica for her number, she gives him Sierra's number instead, because Veronica has a boyfriend who is in college, and she also wishes to embarrass Sierra. This lie leads to Jamey texting Sierra, believing she is Veronica. After texting and flirting with each other for a while, Sierra soon begins to like Jamey, although she realizes he thinks he is texting someone else. During band class the next day, Sierra immediately tells her best friend Dan (RJ Cyler) about what has happened, claiming she has "met a guy." Dan responds very skeptically, informing her, "It's called catfishing, and I'm pretty sure it's illegal." She defends herself, saying that either way, they are her words. When Sierra discovers that Jamey believes he is texting Veronica, she approaches Veronica, who is upset after being dumped by her college boyfriend, Spence, who considers Veronica to be too dumb. She offers to tutor Veronica, in exchange for help in continuing to talk to Jamey. Veronica agrees, and they begin tutoring. As they continue helping each other, Sierra learns more about Veronica's frustrating family life, and Sierra begins to grow on Veronica. Veronica reveals how her father abandons her mother for a 22-year-old and how it has changed both her and mother's life. One night, Jamey video calls Veronica, who appears on the camera screen while Sierra talks behind it. The video call soon ends when Jamey tells her there is lag, and as soon as they hang up, Sierra and Veronica gleefully laugh together over the fact that it worked. Although initially cold to one another, Veronica and Sierra end up being friends. When Jamey asks Sierra, who he believes to be Veronica, out on a date, Veronica goes with him as a favor to Sierra. However, when he tries to kiss Veronica, Veronica tells him to close his eyes and Sierra kisses him instead, and Jamey believes that he kissed Veronica. Before a football game, Jamey kisses Veronica. Veronica is angry at Jamey for doing this, because she feels like she is betraying Sierra. Jamey does not understand why she is angry, because he believes that she was the person he kissed on their date. Sierra witnesses the kiss and assumes that Veronica kissed him on purpose. As revenge, she decides to expose the fact that Veronica was dumped by her ex-boyfriend over direct message. During the football game, Veronica angrily tells Jamey the truth, and when a panicked Sierra attempts to defend herself and explain, he recognizes her voice. Shocked, he tells both Sierra and Veronica to stay away from him and leaves. Sierra writes a song called "Sunflower" and sends it to Veronica as an apology. Veronica sends the song to Jamey and tells him about what a great girl Sierra truly is. He decides to forgive Sierra and take her to homecoming, bringing her a sunflower. After admitting that she is exactly his type and expressing his feelings for her, they kiss again and go to homecoming together. While there, Veronica and Sierra see each other, and without a word, they share a reconciling embrace by hugging and Dan joins in. The film was first announced in September 2016 as a modern retelling of the Cyrano de Bergerac story, to be directed by Ian Samuels from a screenplay by Lindsey Beer (Chaos Walking), and with Ben Hardy in the male lead role. In the same announcement, it was revealed Molly Smith and Thad Luckinbill's Black Label Media (Sicario, La La Land) would produce the film, with Beer executive producing. On January 18, 2018, it was announced that Netflix had acquired the rights to the film. In December 2016, RJ Cyler was cast as the title character's best friend. On January 5, 2017, Shannon Purser was cast as Sierra Burgess, and the following day, Kristine Froseth was cast in a supporting role. Later that same month, Will Peltz joined the cast in a co-starring role. On February 1, 2017, Noah Centineo was cast as the male lead, taking over from Ben Hardy who had been previously attached in the role. Also in February 2017, Lea Thompson and Alan Ruck joined the film as the title character's parents. The film released on September 7, 2018, exclusively on Netflix. On review aggregator Rotten Tomatoes, the film has an approval rating of 64% based on 36 reviews, and an average rating of 5.9/10. The website's critical consensus reads, "Sierra Burgess Is a Loser, but her movie's okay - largely thanks to Shannon Purser's work in the title role, which is strong enough to counter an uneven narrative." On Metacritic, the film has a weighted average score of 60 out of 100, based on 14 critics, indicating "mixed or average reviews". The film has been criticized by many for romanticizing certain character choices by the female protagonist, Sierra Burgess, who, in the movie, is involved with activities such as catfishing and sharing a non-consensual kiss with her love interest, hacking, cyber bullying and mistreating her friend, and pretending to be deaf with support from one of her friends. ^ a b Fleming Jr, Mike (September 9, 2016). "Ben Hardy to Topline Modern Cyrano de Bergerac Pic 'Sierra Burgess Is a Loser'". Deadline Hollywood. ^ Hipes, Patrick (January 18, 2017). "Netflix Seals Deal For 'Sierra Burgess Is a Loser'". Deadline. Retrieved January 18, 2017. ^ N'Duka, Amanda (December 1, 2016). "RJ Cyler Cast In 'Sierra Burgess Is A Loser'; Annika Marks Boards 'The Last Champion'". Deadline Hollywood. ^ Hipes, Patrick (January 5, 2017). "'Stranger Things' Shannon Purser To Star In 'Sierra Burgess Is A Loser'". Deadline Hollywood. ^ Hipes, Patrick (January 6, 2017). "Kristine Froseth Joins Class For 'Sierra Burgess Is A Loser'". Deadline Hollywood. ^ Hipes, Patrick (January 27, 2017). "Benedict Hardie Joins 'Stem'; Will Peltz Enrolls In 'Sierra Burgess'". Deadline Hollywood. ^ N'Duka, Amanda (February 1, 2017). "Miya Cech Joins Fox's 'The Darkest Minds'; Noah Centineo Cast In 'Sierra Burgess Is A Loser'". Deadline Hollywood. ^ N'Duka, Amanda (February 14, 2017). "Lea Thompson & Alan Ruck Join Black Label's 'Sierra Burgess Is A Loser'". Deadline Hollywood. ^ Hernandez, Brian Anthony (July 14, 2017). "Songwriter Leland Talks Selena Gomez's 'Fetish' & Working With Fellow Queer Artists". Billboard. ^ "Sierra Burgess Is a Loser (2018)". Rotten Tomatoes. Retrieved December 23, 2018. 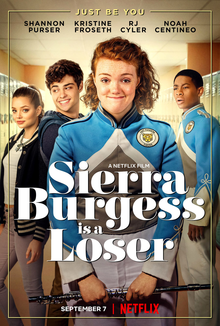 ^ "Sierra Burgess Is a Loser Reviews". Metacritic. Retrieved September 10, 2018. ^ "Netflix's 'Sierra Burgess is a Loser' fails on so many levels: Review". Mashable. Retrieved September 11, 2018. This page was last edited on 19 March 2019, at 16:57 (UTC).